It’s back to school. Right now, across the Commonwealth, there are children dreading the thought of another full academic year. They are lying in bed, reflecting on their carefree summer full of ice cream, blue swimming pools, barbecues and theme-park vacations—lamenting that it is the last night of the sweetest time of year. New shoes and a new backpack are little consolation for all the anguish they will meet in the morning. I was not one of those kids. Although I wasn’t much for waking up early, I loved going back to school. All summer I tried to anticipate what we would be learning the next year. I tried to skip ahead and get a leg up on the other kids. I was thrilled when they implemented summer reading programs, because I had some direction. Summer was hot, I was bad at sports and we went to historic sites for vacation. I was ready to go back. I know there are some of you just like me. You might have played it off in front of your friends and joined the “school is whack” rallying cry. But deep inside, you really liked your teacher, the classroom and all the new things you would learn. Well, this is for you! SWAT (Specialists with Arts Tactics) Team: consultancies for schools and districts with specialists trained in the Program Review for Arts and Humanities. Fee is paid by the arts council. Teaching Art Together (formerly Teacher Initiated Program grants): grant enabling teachers to collaborate with teaching artists to design authentic arts experiences for students across the curriculum. TranspARTation: funding to support field trips to designated museums, performance venues and arts centers. Poetry Out Loud: a national poetry recitation competition through the National Endowment for the Arts and the Poetry Foundation. We have brochures available upon request! If you are a teacher: what are you waiting for? The best days—for kids of all opinions about school—were the days where something different happened. If you are parent, tell your kids’ teachers and school administrators about these opportunities. 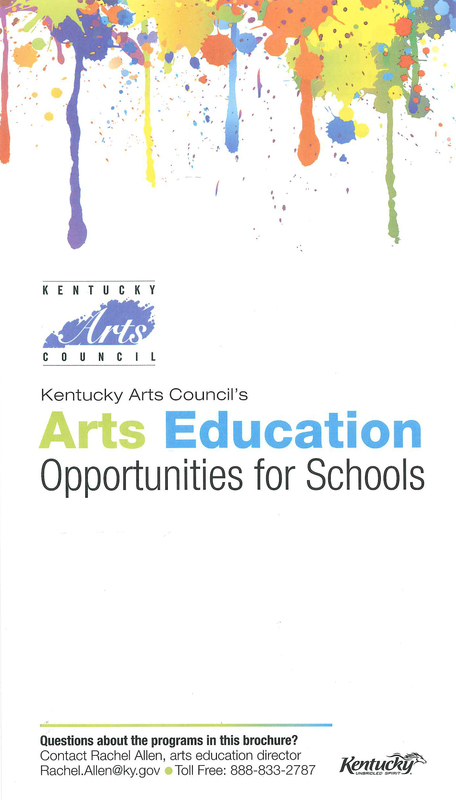 More importantly, let them know that you want art in your students’ education. If you’re a teaching artist: good luck and good year. If you’re a student: it’s only about nine more months until summer comes back around.